Hello - I hope you had a nice weekend. It was my daughter's 8th Birthday so I was busy making her cake, getting the house ready, etc.. I can't believe how fast they grow - my little April is all grown up! April's favorite color is green, so I pulled out a green to wear on her birthday. This is Hard Candy "Crush on Ivy". Crush on Ivy is part of Hard Candy's Crushed Chromes line. It's such a gorgeous ivy green foil polish that is opaque in two easy coats. This is the first Hard Candy polish I have ever tried and I'm impressed. While taking a look at the new Zoya Irresistible Collection on my dresser, I noticed that Zoya Rikki was identical to Crush on Ivy in the bottle, so I decided to compare them for this post. Not only are they identical in the bottle, they are also perfect dupes on the nails. 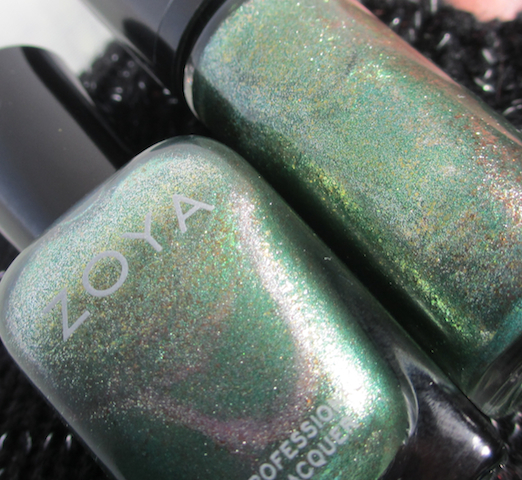 Rikki is described on Zoya's website as a "fern foil metallic". As you can see, it's equally as beautiful as Crush on Ivy. I can honestly say that I couldn't find any differences between the two. If I had to get really picky and find a difference, I think Rikki's glitter was a bit more chunky in the first coat. But once you add the second, you can't tell the difference at all. I just wanted to show the close-up shot of the bottles next to eachother. They even have the same multi-dimensional finish. It's crazy. These two also reminded me of Rimmel Rags to Riches that I reviewed here, but Rags to Riches is more of an olive green. I was so excited to show the dupe, that I posted the pic above on FB a few days ago. A few people mentioned that if you calculate the amount of polish you get in the Hard Candy bottle vs. the Zoya, it's not really cheaper. So if you plan on going through the whole bottle, perhaps it wouldn't matter which one you chose. But I barely ever go through a whole bottle of nail polish, so if I would have to choose between two exact dupes, I would go for the cheaper alternative (in most cases). It's all personal preference though. Also, Hard Candy is readily available at Wal-Mart. I wanted to play around with PicMonkey (photo editing site) for the last shot. I thought it would be nice to create a "Pinterest Friendly" photo. It was kindof fun and I think I'll continue to do this if I have a photo that will work. 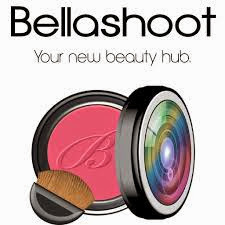 If you are a blogger and are looking for a site to edit your photos and add a watermark, I highly recommend PicMonkey. What is your take on exact dupes? Will you go with the higher-end polish, just because of the brand name? Or will you grab the cheaper alternative and save some money? *Zoya Rikki and Hard Candy Crush on Ivy were provided for my honest review. Please see the disclosure policy for more information. Pretty! I don't have a preference so I'd get either one. Awww Happy belated Birthday to April!! It is UNREAL how identical these two are! Honestly, if you wouldn't have told me which is which I would have thought you were only wearing one polish. If I didn't already own Rikki, I might just have picked up the Hard Candy dupe! Yes, you can't tell at all. Those two are exact. And exactly beautiful too! :) I think I would pick up the Hard Candy simply because I don't think I'd ever use the whole bottle of this. The new Hard Candy foils all look great. Yes, I'm impressed so far! Thank you so much for the tip about PicMonkey, btw...I'd been wondering how everyone does watermarks. You are welcome:) Thanks for your comment Emily! Kids do grow up so fast. My oldest turned 10 last week. Blows my mind that I've been a parent for 10 years. Great dupe comparison. I have the Zoya and a Color Club from the foiled collection that is similar so I'll avoid the Hard Candy one. Thanks for the great post. I know...it's crazy how time flies. Thanks! I know, my Ulta takes forever too. Keep stalking! Those are both beautiful polishes! I've been trying to get my hands on Hard Candy polishes for quite a while, but they're always out of stock at the few Walmarts near me. OMG, they are dupes. You are so good at it. I wish you could come to Houston one day to help me find my dupes so I can really do a blog sale. I bought one Of the Hard Candy crushed lava. I bought glitters and i love them and their price. Very catch on recognizing the dupes. They sure do! Thanks for stopping by! :) Yes, they really are. No need to have both! Very pretty! I cannot see any difference between them!